Looking south on Washington Street in Roslindale, triple-deckers line both sides of the thoroughfare along with small storefronts housing convenience stores and laundromats, among other amenities. Note the number of bus routes that stop on Washington Street; with the exception of the 35, all of these were once served by streetcars. When electric trolley lines were extended further from downtown Boston in the 1890s and 1900s, real estate developers quickly caught onto the trend and sought to build affordable homes conveniently located with access to new trolley lines. Thus began the general trend of development in turn-of-the-century Boston: as trolley lines were extended, apartment buildings were constructed around the trolleys, providing residents with a quieter lifestyle away from the bustle of the city yet with convenient access to reliable public transportation that would quickly take one downtown. The vast majority of apartment buildings constructed in Boston around trolleys were wooden triple-deckers. Due to the low cost of constructing triple-deckers and their efficient use of land plots, it made lots of sense to build, and likewise to buy, triple-deckers. Triple-deckers were a solid investment for a buyer—one could purchase a triple-decker at a reasonable price, live in one of the units and rent the other two out to help pay off one's mortgage. Alternatively, one could house family in the other two units—it was not uncommon for three consecutive generations of a family to live in one Boston triple-decker. Morton Street on the Dorchester-Mattapan Line. Scroll around the street view, and you will see that Morton Street and the surrounding side streets are almost completely lined with triple-deckers! While a trolley never ran on Morton Street, the 29/Mattapan-Egleston streetcar, whose route along Blue Hill Avenue was within minutes walking distance of Morton Street, sufficed as more than adequate transportation to fuel the development of Morton Street and the surrounding area and to transport residents to and from jobs, shopping and other attractions in Dudley Square, downtown and elsewhere. Triple-deckers were constructed in large volumes along trolley lines in Dorchester, Mattapan, Jamaica Plain, Roslindale, East Boston and other parts of Boston further from downtown. Many triple-deckers were also built in the neighboring cities of Cambridge and Somerville, which were also served by BERy streetcars. Accordingly, one can see triple-deckers along just about any former trolley route. In many areas with high triple-decker concentrations, such as on Morton Street above, the surrounding triple-deckers have been painted in a variety of colors over the years, resulting in an artful urban collage of buildings that enlivens many of Boston's residential neighborhoods. Geneva Avenue in Dorchester, once home to the 19/Dudley-Fields Corner streetcar and, a little further back towards Bowdoin Street, the 17/Andrew-Fields Corner streetcar. As you can see above, triple-deckers were constructed by developers directly around the 19 streetcar, which would have run right down this section of Geneva Avenue towards its terminus at Dudley Square, so as to take advantage of the trolley and provide future residents with convenient transit access, ensuring that the properties would remain desirable for years to come. In addition to wooden triple-deckers, the dominant form of real-estate in Boston's "streetcar suburbs," there are other characteristic Bostonian architecture styles which were focused around trolley routes. Most buildings built around trolleys were multifamily, and likewise there were apartment buildings other than triple-deckers that were constructed in large numbers in Boston. Red and yellow brick apartment buildings are the next most dominant apartment building style in Boston. such buildings were built predominantly in Brookline, Brighton, Mission Hill, the South End and the Back Bay around trolley lines. Brick apartments were more expensive to build, and likewise they are found in streetcar districts originally conceived as upper-middle-class, such as Brookline, the South End and the Back Bay. Such buildings are also found in significant numbers in the Fenway District, Brighton around Commonwealth Avenue, Mission Hill around Huntington Avenue and around Elm Hill in Roxbury. Red-brick apartment buildings on Beacon Street in Brookline. As can still be seen above, these buildings were built around the 61/C streetcar that ran and still runs to Downtown Boston. The other significant housing style in Boston built around trolleys is the wooden multifamily house. Many of these houses were originally constructed as large single-family homes with convenient public transit access and later converted to multiple units, but still many were built as multifamily units from the start. Wooden multifamily houses along Broadway in Somerville, along the 89/Sullivan-Clarnedon Hill Carhouse and 101/Sullivan-Salem Street Carhouse streetcar, and later trackless trolley, routes that ran on Broadway. Geneva Avenue in Dorchester, where the 17/Andrew-Fields Corner and 19/Dudley-Fields Corner streetcars ran—this view of Geneva Avenue, from Corona Street, is less than half a mile away from Fields Corner Station and the adjacent site of the former Park Street Carhouse, from which many of Dorchester and Roxbury's streetcar, and later trackless trolley, operations were based. As you can see, the stretch of Geneva Avenue shown above is entirely lined with triple-deckers. Seaver Street in Elm Hill in Roxbury, across from Franklin Park and near the intersection of Seaver Street and Blue Hill Avenue. The 29/Mattapan-Egleston streetcar ran in a private reservation across Seaver Street from the buildings shown above. As you can see, there are multiple housing styles that were built around this stretch of route 29, from the wooden two-family on the left to the single-family houses in the middle to the brick apartment building on the right. Ashmont Street by Adams Street in the Lower Mills neighborhood of Dorchester, about half a mile from Ashmont Station, located further southwest down Ashmont Street, and along a former trolley route that ran down Adams Street that was one of the first trolley routes in Boston to be bustituted. As you can see by scrolling around the view, there are a variety of wooden triple-deckers and multi-family houses on Ashmont Street. Note the variety of colors in which the wooden triple-deckers and multi-family houses have been painted! The 1915 BERy map shown above shows a trolley running along Adams Street right by where the houses shown on Ashmont Street stand. 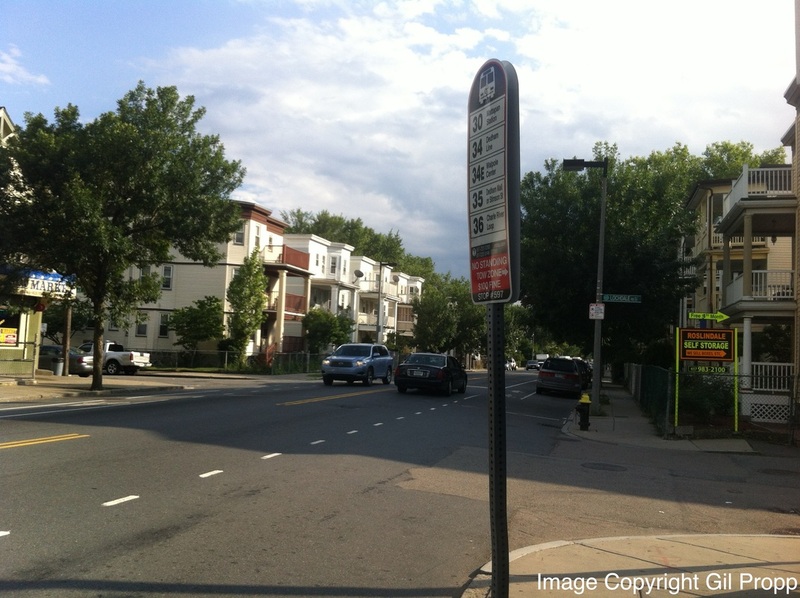 Since the Red Line has not yet been extended to Dorchester, Ashmont Station is not shown on the map; it is now located by the intersection of Talbot Avenue and Dorchester Avenue. Map courtesy Ward Maps. The 1925 BERy map shown above shows that the trolley that ran along Adams Street has been bustituted, making it one of the first trolley routes in Boston to be bustituted. Focusing real estate around trolleys was logical not only when buildings were built, but for the future as well. A common psychological perception of streetcars and trackless trolleys that was strong when trolleys still ran was that, because of their additional infrastructure, they were where they were to last. That thought was obviously proven wrong as the years went by, but since the buses that replaced trolleys generally follow the same routes the trolleys did, the fact still holds true that building around trolley lines was a solid investment and a spot-on projection of future trends and future centers of activity in Boston.